McGraw-Hill Workforce's Career Companion series provides up-to-date career information and contextualized skill practice to help learners succeed in the 21st century workplace. Each book in the series provides information and resources to help learners explore and prepare for careers within one of the 16 career clusters. 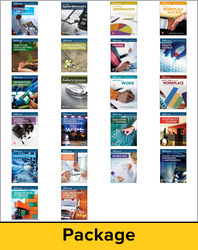 This set includes one copy of each title in the Career Companion series, plus one of each title in the Workplace Skills series, for a total of 22 books.